True story: my bedroom is looking more and more like a beauty hall by the day. I'm even considering putting up some shelves to house all my lotions and potions. Why am I telling you this? Because I am a skincare and beauty addict. Loud and proud. I can talk for days about skincare and love nothing better than sitting down with someone to do just that. With an every growing beauty cupboard, I thought it was about time that I did a round-up of some of my favourite products right now (part 2 will come soon I promise - I just couldn't fit them all on the one table for the shot!). My skin type is generally normal to combination with the added pleasure of the occasional hormonal breakout. So if that's something that you suffer from too, then I think a few of these products below might just be ready to save your skin. Beauty shopping list at the ready? Let's go then..
Nip + Fab Glycolic Fix Night Pads - Recently I suffered the mother of all hormonal breakouts. My face had a complete freak out so naturally, I did too. I was short for time to buy products to help get rid of the spots asap but was recommended these night pads to help clear things up. Being a super cheap skincare option, I ran to my nearest Superdrug and snapped them up - I'm so glad I did, I really recommend them! They contain 5% glycolic acid which is great for gentle exfoliating and also any acne scarring or pigmentation you may suffer from. The salicylic acid also works to unclog pores to stop any nasties coming to the surface. The final two key ingredients are lactic acid (great for removing dead skin cells) and hydraluronic acid (perfect for plumping!). Nip + Fab Glycolic Scrub Fix - Alongside the night pads, I also picked up the scrub which has gone straight up the list to favourite exfoliating scrub. Another good value option, it works deep into the pores and helps remove any dead layers of skin hanging around. Skin really does feel smooth after the first use - you'll be as hooked as I am. La Roche-Posay Effaclar Anti-Imperfection Corrector - I was recommended this lotion by a friend when I was having the hormonal breakout breakdown. I can't say I'm at all familiar with La Roche-Posay as a brand but I've heard good things and so far, I'm really enjoying using this. The corrector is a lightweight lotion which aims to stop the breakout from developing, purifies the skin and helps it to regenerate itself (reducing the risk of the dreaded acne scarring!). Super lightweight and un-imposing on skin, it's definitely a beauty cupboard staple (and so cheap!). Fresh Soy Face Cleanser - A brand that has never been on my radar before, I really enjoy using this in the morning. It's a great everyday face cleanser which thoroughly cleanses the skin gently and leaves skin wonderfully soft and clean. Key ingredients include rosewater to calm and balance, cucumber to soothe and soy proteins which help towards maintaining the skins elasticity. Nuxe Rêve de Miel Body Scrub - Just because winter's coming doesn't mean you can start neglecting your skin. Brand new to Nuxe, this body scrub does the buffing and the hydrating in one thanks to its honey properties. Leaves the skin super soft too - which in winter, is a such a treat for the skin! Herbivore Lapis Facial Oil - I recommend this to anyone that has blemish-prone skin! 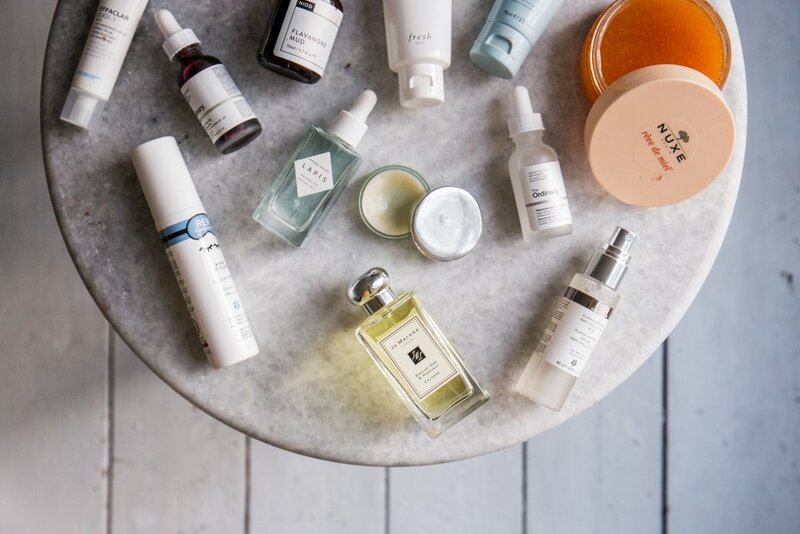 I love Herbivore as a brand - sadly, you can't buy it anywhere in the UK (just yet) but you can buy online (alternatively do what I do, which is give anyone going to the US a shopping list and make them go to the nearest Sephora to pick some of this stuff up!). Whenever I'm suffering from bad skin, I smother my face in the blue oil and know that in the morning, I'll be a lot better off. It really does work miracles on the complexion thanks to key components like blue tansy and kukui nut oil. Trust me, this works! And if you're scared of using an oil on oily skin - do not be! Oily skin is often oily because you've stripped it of moisture in the first place therefore your skin overcompensates and produces excess oil. Adding an oil into your routine will help even things out. Go on, try it! Jo Malone English Oak & Hazelnut Cologne - I absolutely adore the new English Oak collection from Jo Malone. I remember sniffing away at a friend's bottle and instantly fell in love with the scent. It veers on the masculine side which I absolutely love and it's my go-to scent day and night. I also have the English Oak & Redcurrant which I layer on top of the Hazelnut scent - it's autumn in a bottle and it's beautiful. Both should definitely go on your Christmas wish-lists immediately - next time you're near a store, I'd really recommend you pop in and have a sniff. REN & Now To Sleep Pillow Spray - Because sometimes, I need that extra bit of help getting to sleep! I love the new pillow spray from REN (a brand I absolutely love) which contains frankincense, hops and lavender which help to promote relaxation, reduce anxiety and help you reach the land of nod. As with many of REN's products (as they're so reasonably priced), it's a perfect stocking filler and I guarantee that anyone receiving one will be grateful for the gift of a good night's sleep! La Mer Lip Balm - Possibly the priciest lip balm I've ever owned but honestly, it might just be my favourite! La Mer is a total indulgence but if you have the cash, this balm is worth the splash. It soothes dry skin and renews your lips - it also tastes rather good too! Niod Flavanone Mud - This mask is amazing for decongested skin - it works miracles. To explain what it does is a rather lengthy process - and in truth, you're better off reading the full low-down over on the page itself (just click the link in the title for that!). But what I will tell you, is that this is going to be a staple in my beauty cupboard for years to come. It was recommended to me - and I would recommend the same - to do an accelerated start with the mud. What's meant by that is simply use it once per day for the first five days of using it - I swear you'll see the changes in your skin. It does tingle slightly when on the skin and for a little while after you rinse it off but that's just a good thing in my books. For £29, better skin really is affordable. The Ordinary Niacinimide 10% + Zinc 1% - Feel yourself about to have a breakout breakdown? Apply this stuff. It really helps stop things getting worse and out of control. I definitely think my hormonal breakouts would have been a whole lot worse if I hadn't applied this religiously morning and night. A high concentration of niacinamide helps to balance aspects of sebum activity meaning it's got your skin's back. The Ordinary is a fantastic brand to get acquainted with - ridiculously well priced with products that really work. Get yourself to a store immediately, there's a reason for all the hype! REN Flash Defence Anti-Pollution Mist - Another stocking filler that would absolutely go down a treat. This mist is on a mission to help protect your skin from harmful free radicals and environmental pollution. I use every morning after I've finished my make-up and it just leaves my skin feeling refreshed and perked up. It's also great to just keep in your bag for when you need a little face refresh. I even carry it on the plane when I travel and give myself a spritz every now and again. Serious bliss and it smells wonderful too. The Ordinary AHA 30% + BHA 2% Peeling Solution - Essentially this is a 10 minute exfoliating facial in a bottle. Probably not one for sensitive skins (due to the acids in the product) but if you're a tough one, then another great buy to add to the list. Never leave on for longer than 10 minutes or use more than twice a week, but you'll notice visible results after a couple of uses. Great for pore decongestion, boosting skin texture and reducing fine lines, it's devilishly good... which maybe explains why it comes out red from the bottle.